Clorder was founded to empower restaurants with a platform to build, establish, and grow their online presence. By leveraging Clorder's Online Ordering system, consisting of web application, Facebook application, and Mobile application, restaurants can not only receive online orders from any device and anywhere but also be able to create their own CRM with the suite of services that Clorder offers. Packed with powerful marketing services and ideas to grow sales, Clorder helps restaurant owners step by step and offers strategic and marketing services for new and growth state restaurants. The GetSwift integration with Clorder now helps you not only process orders for delivery on your Clorder account but now allows those orders to be sent instantly to your GetSwift account so you can start dispatching, tracking and managing the deliveries to be fulfilled out in the field! Mypreorder is an online & smartphone ordering platform that enables you to build a successful ordering platform. It allows your customers to pre-order your restaurants food and drinks online and from your branded mobile app (iOS and Android) while easily integrating with your current POS system! The GetSwift integration with mypreorder now helps you not only process orders for delivery on your mypreorder account but now allows those orders to be sent instantly to your GetSwift account so you can start dispatching, tracking and managing the deliveries to be fulfilled out in the field! Now you can automatically upload your online orders from mypreorder directly into your GetSwift account through the direct API integration! If you need any additional help getting that set up, contact us today to help connect both platforms for you. BigCommerce is an ecommerce platform that enables you to build a successful online business & website. Once you create your BigCommerce account you can begin setting up product catalogues & menus and start selling online. The GetSwift integration with BigCommerce now helps you not only process orders for delivery on your BigCommerce account but now allows those orders to be sent instantly to your GetSwift account so you can start dispatching, tracking and managing the deliveries to be fulfilled out in the field! Now you can automatically upload your online orders from BigCommerce directly into your GetSwift account through our Email Importer! If you need any additional help getting that set up, contact us today to help connect both platforms for you. Clover is a leading next-generation global POS and payment processor that lets you accept credit cards, EMV chip and contactless payments from customers, safely and securely. The Clover family includes 5 different POS systems to handle your specific needs: Clover Station, Clover Mini, Clover Flex, Clover Mobile, and Clover Go. The GetSwift integration with Clover now helps you not only process orders for delivery on your Clover POS but allows those orders to be sent instantly to your GetSwift account so you can start dispatching, tracking and managing the deliveries to be fulfilled out in the field! To get started with your Clover integration, follow our simple 5 minutes quick start guides below or contact us for additional help. Eat24 is an online ordering platform for restaurants to list their menus and be sent new orders for pickup and delivery. The GetSwift integration with Eat24 now helps you not only process orders for delivery on your Eat24 account but now allows those orders to be sent instantly to your GetSwift account so you can start dispatching, tracking and managing the deliveries to be fulfilled out in the field! Now you can automatically upload your online orders from your Eat24 directly into your GetSwift account through our Email Importer! If you need any help getting that set up, contact us today to help connect both platforms for you. EatNow is an Australian based online ordering platform where over 7,500 restaurants list their menus to collect new orders for pickup and delivery. The GetSwift integration with EatNow now helps you not only process orders for delivery on your EatNow account but now allows those orders to be sent instantly to your GetSwift account so you can start dispatching, tracking and managing the deliveries to be fulfilled out in the field! Now you can automatically upload your online orders from your EatNow directly into your GetSwift account through our Email Importer! If you need any help getting that set up, contact us today to help connect both platforms for you. Not a Developer? No Developers available? No problem...If you can automate the sending of an email, than you can automate the process of entering tasks into GetSwift Regardless of the email format, chances are we can figure out a way to grab the relevant information. Here we are going to step through how to use email parsing with Zapier's built in parser. You'll be told to send your email to an odd looking address. This address is your new mailbox! Go ahead and send an email order to address before proceeding to the next step. 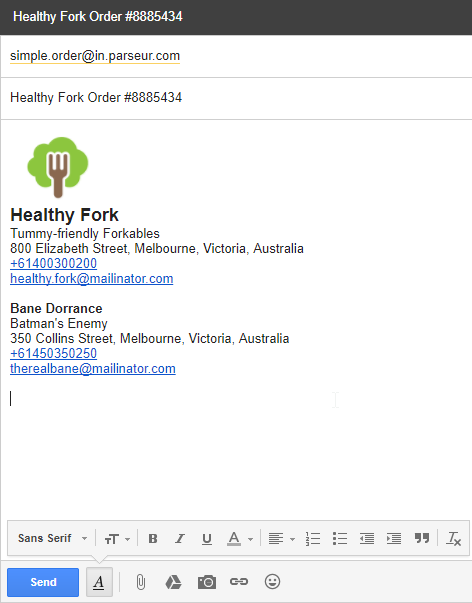 Try to make this email look as close to what it would look for a real order coming from you system (i.e., remove 'FWD' and any signature or email headers). Go ahead and save your template once you've finished. You'll be able to test out the template you've just created by sending another order email to parsing email. If everything looks good, head to step 3. If not, let us know and we'll be happy to assist. Step 3: Head over to Zapier, login, and select 'Make A Zap'. Zapier works with 'Triggers' and 'Actions'. We are going to start by setting up the Trigger. Enter 'email parser' into the 'Choose a Trigger App' search field and select 'Email parser by Zapier'. Then select 'New Email' as the option associated with the email parser. Connect the Zapier Email Parser account that you made in step one using your email and login password. Once you've connected, select 'Save + Continue'. Next, select the mailbox you want to use - this will be the mailbox you set up in step one. Step 4: Choose an Action App - You are going to do this the same way you chose a trigger app, except this time search for and select 'GetSwift'. Select 'Create Task' as the GetSwift action. Step 5: We'll now need to connect your GetSwift account to your Zap. Go ahead and select 'Connect an Account'. You'll need the API key associated with your GetSwift account, which you can find here: https://app.getswift.co/Merchant/APISettings. Generate a key if haven't done so already. Once you've connected, select 'Save + Continue'. 'Future Tasks' are based on the pickup time (not delivery time). GloriaFood is a free online ordering system for restaurants. With this online food ordering system, you can easily take food orders directly from your website. The set up is piece of cake: just fill out your restaurant profile and add your custom “See MENU & Order” button on your site. To get started with your GloriaFood integration, follow our simple 5 minutes quick start guide linked below or contact us for additional help. Google Sheets is a free and simple way to create and edit spreadsheets online, allowing you to store your customer and order information in the cloud. Typical information includes customer name, customer address, customer suburb, customer zipcode/postal code, customer phone & customer email. GetSwift can be integrated with Google Sheets via Zapier. Zapier allows you to move information between your web apps automatically, so you can focus on your running your business instead of on administrative tasks. With Zapier you can send new orders from Google Sheets directly to your GetSwift account, which will then appear on your map as a new delivery! To get started with your Google Sheets integration, follow our simple 20 minutes quick start guide. We can also help you setup the integration for a small additional fee. Please contact us here or through the live chat to learn more or if you have any other questions. Grubhub is an online ordering platform for restaurants to list their menus and be sent new orders for pickup and delivery. The GetSwift integration with Grubhub now helps you not only process orders for delivery on your Grubhub account but now allows those orders to be sent instantly to your GetSwift account so you can start dispatching, tracking and managing the deliveries to be fulfilled out in the field! Now you can automatically upload your online orders from Grubhub directly into your GetSwift account through our Email Importer! If you need any additional help getting that set up, contact us today to help connect both platforms for you. Do you need a no-hassle white labeled solution for customers to place delivery orders through your website and have those orders link directly to GetSwift? Jotform is a simple form creation platform that can create visually appealing and user-friendly delivery order forms. If you do not have web developers who can help you create direct connections between your different systems, then this is the perfect solution for you. Take a look at our sample booking form with instant quoting and payment capabilities that we built. GetSwift can be integrated with Jotform via Zapier. Zapier allows you to move information between your web apps automatically, so you can focus on your running your business instead of on administrative tasks. With Zapier you can send new orders from Jotform directly to your GetSwift account, which will then appear on your map as a new delivery! To get started with your Jotform integration, take a look here. We can also help you setup the integration for a small additional fee. Please contact us here or through the live chat to learn more or if you have any other questions. JustEat is an online ordering platform for restaurants to list their menus and be sent new orders for pickup and delivery. The GetSwift integration with JustEat now helps you not only process orders for delivery on your JustEat account but now allows those orders to be sent instantly to your GetSwift account so you can start dispatching, tracking and managing the deliveries to be fulfilled out in the field! Menulog is an online ordering platform for restaurants to list their menus and be sent new orders for pickup and delivery. The GetSwift integration with Menulog now helps you not only process orders for delivery on your Menulog account but now allows those orders to be sent instantly to your GetSwift account so you can start dispatching, tracking and managing the deliveries to be fulfilled out in the field! To get started with your Menulog integration, follow our simple 5 minutes quick start guide or contact us for additional help. OrdersIn is an online ordering franchise system for restaurants. With OrdersIn, you can provide online ordering as a service to local businesses under your brand. GetSwift can be integrated with OrdersIn, allowing you to provide an end-to-end online ordering and delivery management solution to your customers. To get started with your OrdersIn integration, follow our simple 5 minutes quick start guide or contact us for additional help. Quickbooks Online is an online accounting software for small and medium-sized businesses. You can set up that integration up directly through Zapier or contact us today to help you connect both platforms for you! Shopify is an ecommerce platform that enables you to build a successful online business & website. Once you create your Shopify account you can begin setting up product catalogues & menus and start selling online. The GetSwift integration with Shopify now helps you not only process orders for delivery on your Shopify account but now allows those orders to be sent instantly to your GetSwift account so you can start dispatching, tracking and managing the deliveries to be fulfilled out in the field! Take a look at the instructions below to get started or contact us for additional help. In the second last field called "Email orders will be sent from"
The order listed above was not automatically filled as it was marked by fraud risk. This order may be fraudulent. Check order in the administration section of your store and contact the customer to verify their information. BOOM - how good does that feel now? Square is a leading global POS and payment processor that helps businesses process in store and mobile payments, manage inventory, locations, and employees, access financing, and grow sales. Square also owns Caviar, which is a food ordering service for popular restaurants in major cities across the United States. The GetSwift integration with Square now helps you not only process orders for delivery on your Square account but now allows those orders to be sent instantly to your GetSwift account so you can start dispatching, tracking and managing the deliveries to be fulfilled out in the field!